This section describes the 'p' paragraph element and other flow content elements that can be used to create a flow of vertical blocks. The next level of HTML content structure below sections is called flow content, which can be viewed as a flow of vertical blocks in Western language reading style. Each block can be a text paragraph, a list of items, a spreadsheet of tabular data, etc. 1. "p" element represents a flow content block with a paragraph of text and phrasing content elements. 2. "ul", "ol" or "dl" element represents a flow content block with a list of items. 3. "table" element represents a flow content block with a tabular data items. 4. "pre" element represents a flow content block with a block of preformatted text and phrasing content elements. 5. "address" element represents a flow content block of contact information. 6. "header" element represents a flow content block of introductory information. 7. "footer" element represents a flow content block of foot notes. 8. "figure" element represents a flow content block of reference data. 9. "hr" element represents a flow content block acting as a flow breaking marker. 10. "div" element represents a flow content block acting as a wrapper of child blocks. 11. 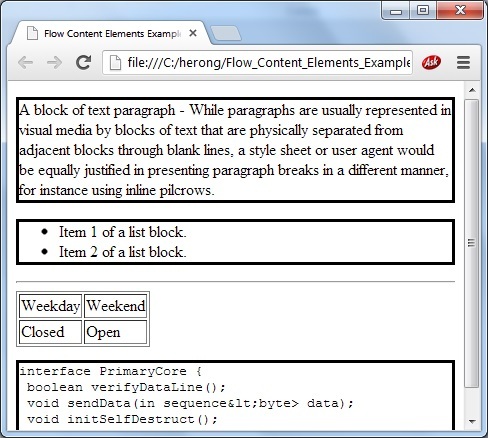 See HTML specification for other flow content elements.